When the Department of Homeland Security was founded after the September 11th attacks and ensuing War on Terror, it immediately became necessary for colleges and universities to build educational programs to prepare students for the many new, or drastically reinvented, careers that would be effected by the new department and the many agencies it oversees. Homeland Security now encompasses 22 different government agencies, and works with countless private, non-profit, and civilian contractors, not including its own 200,000 federal employees. With a budget of over $100 billion, and responsibility for environmental disasters, terrorist attacks, and other large-scale events, Homeland Security is one of the fastest-growing job markets. With so many colleges and universities beginning Homeland Security, Emergency Management, and related degree programs, the emergency management and homeland security academic communities have begun establishing curricular guidelines to help build consistent and reputable programs that will give students a baseline of knowledge and expertise for their career. While there is no formal FEMA program accreditation at this time, the FEMA Emergency Management Higher Education Project provides information on 310 Emergency Management programs and 224 Homeland Security programs on their College Master List. Careers within Homeland Security are many and varied, from Postal Inspectors to FBI Agents, Federal Air Marshals to cyber security analysts. But it’s not restricted to federal positions; private companies, local law enforcement, and more hire experts from the Homeland Security field. While many local emergency and disaster relief positions can be obtained with an associate’s degree, federal and state, as well as private employment, often requires at least a bachelor’s degree. The Homeland Security Information Network offers an excellent information sharing tool to help working adults in the field, and prospective students who are interested in some aspect of Homeland Security, find practical knowledge about the field. One of the highest-ranked public institutions in the nation, the University of Florida is best known as one of the foremost STEM universities in the south, including fields such as environmental sciences, chemistry, pharmacology, medicine, and engineering. UF is also recognized for excellence in construction and planning, particularly with the Rinker School of Construction Management. Founded in 1935, the Rinker School was the first designated school of its kind, and is known for top-quality professional and technical education. The Rinker School at UF offers an online Bachelor of Science in Fire and Emergency Services. The UF FES degree is administered as a 2+2 program, so students must complete the first two years of foundational courses before transferring to the Rinker School for the final two years of major coursework. As an online program, the FES degree can be completed conveniently enough for working EMS and fire safety workers to keep their jobs while pursuing their degree, and UF’s tuition is one of the lowest rates in the nation, making for an obvious value. Founded in 1925 as a school for pilot and mechanic training, Embry-Riddle Aeronautical University has become the world’s most respected aviation and aerospace institution, and one of the foremost STEM universities, from Applied Science and Engineering, to Computer Science and Business. Embry-Riddle is also U.S. News & World Report’s #1 online college, having built a pioneering online degree platform in their World Campus, which also spearheaded distance and military education beginning in 1970. With their areas of expertise, it is natural that Embry-Riddle would be one of the first institutions to develop a specialized Homeland Security degree program, which can be earned completely online. Embry-Riddle’s curriculum is based specifically on the input of the U.S. military, NSA, Homeland Security, and other experts, creating a degree program that is tailored to the real needs of the field, giving ERAU students a strong advantage on the job market, along with the respected Embry-Riddle name. A U.S. News & World Report top 50 public university, Tulane University is one of the most recognized and admired private research institutions in the South. Tulane has been at the center of learning and development in the region since 1834, with law, medical, and business schools ranked among the oldest and most prestigious nation-wide. Since the devastating Hurricane Katrina in 2005, Tulane has also led the effort to return New Orleans and Louisiana to form. Tulane’s commitment to public service and development makes it a natural choice for a degree in Homeland Security Studies, particularly for those students interested in emergency management and Infrastructure Protection. Offered online through the School of Continuing Studies, Tulane’s Homeland Security Studies degree has been building leaders since 2006, and is taught by established expert practitioners for up-to-date and practical learning. Kansas Wesleyan University is a small, private Christian institution founded in 1886 by the United Methodist Church. As a Methodist institution, Kansas Wesleyan is known for its commitment to community service, leadership, and giving, built on a strongly evangelical worldview and dedication to holistic intellectual and spiritual development. KWU is best known for professional and liberal arts education, with a growing adult education emphasis. Kansas Wesleyan offers the only Emergency Management degree in the state of Kansas, one which has been recognized for its quality and affordability. The Emergency Management BA can be earned completely online, or in a hybrid program, and an arrangement with Kansas State Polytechnic Institute allows students in the KWU Emergency Management program to earn a minor in Unmanned Aircraft Systems. Three concentrations – Homeland Security, Business Continuity, and Non-Governmental Organizations – allow students to tailor their degrees to their current jobs, or their preferred careers. The University of Central Missouri is a mid-sized public institution in Warrensburg, MO, the birthplace of the phrase “man’s best friend,” and a center for professional learning and technical training for rural Missouri. UCM is known throughout the region for their excellent professional preparation, with some 92% of graduates employed within 6 months, and is considered a best value with one of the lowest tuition rates in the state. To meet the educational needs of central Missouri’s rural and working-class population, UCM has invested well and strategically into online education, providing the region’s working adults with educational opportunities beyond the campus. One such program is UCM’s online Bachelor of Science in Crisis and Disaster Management, which brings together a multidisciplinary approach to prepare students for the rescue and recovery demands of natural disasters, accidents, and terrorism. Required field experience makes students even more ready for the real world upon graduation. A small, private Baptist institution in rural Buies Creek, NC, Campbell University has made outreach a significant part of its mission, including military and adult education, besides more traditional undergraduate and graduate programs. Campbell’s relationship with the nearby Camp Lejeune Air Force Base led to the creation of its online degree programs in 1999, and Campbell University Online has matured into a significant part of the school’s identity. Campbell offers both a Bachelor of Science, and a Bachelor of Applied Science, in Homeland Security. While the BS is a more traditional degree, usually preparing students for further schooling, the BAS is a more specialized, terminal degree for technical expertise. Both set students on course for a career in Homeland Security with a strong grounding in all elements of the field. Campbell University’s name is respected throughout the region, with a solid job market reputation and a reasonable tuition rate comparable to most public universities. Founded as a teacher’s college, the University of Wisconsin Oshkosh is part of the nationally-respected UW system, one of the strongest public higher education systems in the US. UWO has kept practical professional and technical education at the heart of its mission, with a particular emphasis on community engagement, civic leadership, and responsibility. UWO’s high-performing nursing, accountancy, and business programs are key to the well-being of the region. UWO offers a fully-online bachelor degree completion program in Fire and Emergency Response Management that is noted as the first such program in the state. Designed by expert practitioners, the FERM program prepares students for leadership in the emergency field, including public safety and administration. Students can transfer up to 60 credits, and an accelerated, 7-week schedule helps qualified students complete the program even faster. UWO also offers a low, flat rate regardless of residency, making the online FERM degree a real bargain anywhere. Part of the Texas A&M University System, one of the nation’s largest public higher education systems, West Texas A&M University is a respected regional institution dedicated to professional and technical education. In addition to acclaim as a regional educator, WTAMU has also been recognized as a top military educator, and a trusted online educator, with numerous online programs being ranked nationally by U.S. News & World Report. WTAMU’s online program in Emergency Management Administration is a model of its kind. This Bachelor of Applied Arts and Science (BAAS) degree is developed by professionals in the emergency management field for full-time and part-time students, and prioritizes adults already working in the field. While foundational classes may be transferred, all 45 credit hours for the EMA degree must be earned at WTAMU, taught by a faculty of experienced experts. With a proven track record of increasing graduates’ salary and position, the WTAMU EMA program is a real investment. The University of Findlay, a small, Churches of God institution in Ohio, has been recognized as a best regional educator by U.S. News & World Report and the Princeton Review. In addition to highly-regarded programs in diverse areas including equestrian studies, nuclear medicine, and occupational and physical therapy, the University of Findlay has also been a pioneer in emergency and disaster studies, including creating the first bachelor’s program in hazardous waste training. That leading role in crisis management education makes Findlay an obvious choice for students interested in an online Emergency Operations program. Findlay offers a Bachelor of Science in Business Management with a concentration in Emergency Operations, preparing students for safety roles in business and industry. Findlay’s fully-online programs are taught by the same groundbreaking experts who helped develop and grow their emergency studies on-campus curriculum, so students can be sure they are at the forefront of the field and have a leg up on the job market. Regularly ranked among the very top regional institutions in the Midwest, Drury University is known as a reliably excellent value, and one of the most successful liberal arts colleges for professional and career education. Drury is proud of a high rate of internships and experiential learning, and a high level of job market success for graduates, reflected in the 96% success rate for students finding employment or graduate education after graduation. Drury offers an online Bachelor of Science in Emergency Management from the College of Continuing Professional Studies. Designed for working emergency professionals, the degree-completion program is made up of a 51 credit curriculum with a concentration in leadership, focused on preparing students to hold administrative and managerial positions in the field. Drury emphasizes student support in its online programs, ensuring that busy working adults will be able to complete their studies without disrupting their lives, and at an incredibly low rate for a respected private university. Alaska’s flagship research university, the University of Alaska Fairbanks is one of the nation’s key institution for environmental, energy, and computer science research and education. With its spread-out population, UAF has also become one of the nation’s leaders in distance and online education, providing crucial professional and technical education opportunities to the people of Alaska and building the next generation of the state’s leaders. In a region as famously remote and challenging as Alaska, it should come as no surprise the the University of Alaska boasts a model Homeland Security and Emergency Management program. The Bachelor of Emergency Management degree-completion program can be earned completely online by students who come in with an associate’s degree in a related field, or applicable military credit. UAF’s tuition is one of the lowest rates anywhere in the US, making the BEM a low-risk investment. A prestigious, small liberal arts college, Mercer University is the oldest and one of the most respected private institutions in Georgia, ranked in the top tier nationally by U.S. News & World Report and recognized as one of the best universities of its kind. Mercer has an ambition to reach the standing of other elite Southern universities, such as Duke and Emory, and have raised their profile significantly in the 21st century, particularly in business, engineering, and law. Mercer offers an online BS in Homeland Security and Emergency Management from the Penfield College of Continuing and Professional Studies, Mercer’s adult education division. While Mercer accepts transfer credits from Georgia junior colleges and community colleges, all coursework for the program is available online, allowing working adults to complete their degree in the most convenient means possible. Mercer’s reasonable tuition puts it on par with many of Georgia’s public universities as well, adding to its already considerable value. One of the oldest Catholic institutions in the US, founded in 1818 by the Jesuit order, Saint Louis University is widely recognized as one of the most prestigious universities in the Midwest, as well as a top 100 university nationally by U.S. News & World Report. This small, private research university is noted for the Jesuit commitment to academic excellence, social justice, and ethical leadership. Those values come together in the Saint Louis University Security and Strategic Intelligence Bachelor of Science degree program. This fully-online program is designed to help working professionals to prepare for careers in intelligence and computer systems. The Security and Strategic Intelligence program provides the opportunity for four concentrations: Business Continuity, Strategic Intelligence, Global Corporate Security, or Law Enforcement Administration. With numerous opportunities, high job market reputability, and reasonable tuition, Saint Louis University’s online Security and Strategic Intelligence is a solid investment. A small, private United Methodist institution, Southwestern College is best known for their excellent adult education programs, with numerous satellite campuses and a considerable slate of online degrees. Southwestern College emphasizes technology, with all on-campus students being issued laptops, and mixes quality professional education for adults with a Christian worldview and commitment to values. The Bachelor of Science in Security Management from Southwestern College is designed for working adults who are interested in, or already working in, the intelligence, security, and emergency management field. Southwestern College’s Professional Studies division is dedicated to military personnel and veterans, working adults, and other students who need flexibility in their educational career, with low tuition rates and strong student support. Together, the Security Management BS makes for a solid start to a security career. The Florida Institute of Technology is one of the foremost polytechnic institutes in the South, a private research university dedicated to STEM education. Florida Tech’s small student body and world-class faculty allows students to work in direct connection to professional researchers, giving students access to first-rate, first-hand knowledge. Florida Tech has also made major strides in online education. Florida Tech offers a fully-online Bachelor of Science degree in Criminal Justice with a Homeland Security concentration. Unlike other universities’ degree-completion programs, the Florida Tech BS can be completed in its entirety online, from freshman to graduation. With a thorough grounding in criminal justice, as well as a specialization in Homeland Security, the Florida Tech graduate has a wide range of career options. Florida Tech’s low tuition has made it known nationally as a best value, one passed on to the student. Western Carolina University, a mid-sized public institution in the rural Appalachian mountains, is known for its deep connection to the Appalachian region and for providing opportunities in professional and technical education for the people of the region. In addition to groundbreaking programs in Cherokee and Native American studies, Western Carolina is known for teacher education and for criminal justice, with one of the few “body farms” in the US for forensics research. With its deep grounding in criminal justice, public service, and leadership, Western Carolina’s BS in Emergency and Disaster Management is a natural choice. This fully online degree program is designed by an interdisciplinary faculty with real-world expertise and experience to prepare students for leadership in government, military, and civil fields. Plus, WCU uses WebEOC software, the standard for disaster exercises and events, to literally put students in the loop with real-world emergency and disaster management. Western Carolina’s low tuition has given it a perennial place on best-value rankings. The State University of New York is one of the nation’s most respected and esteemed public higher education systems, and SUNY Canton is no exception. Founded as an agricultural College in 1906, SUNY Canton emphasizes career, professional, and technical education for the people of rural upstate New York, including ladder programs to allow students to work their way from certificate, to associates, and all the way up to master’s degree in key career areas like nursing, computer technology, and criminal justice. SUNY Canton Online offers students two degree programs in the area of emergency management and security: an unusual Bachelor of Technology degree in Homeland Security, and a more conventional BS in Emergency Management. Both degrees are available online, with accelerated 7-week courses to help working adults schedule their classes more conveniently, and a solid regional reputation to carry onto the New York job market. Founded as a woman’s college nearly a century ago, Immaculata University is a small, Catholic institution with a particularly strong reputation in professional studies such as nursing, business, and education. Now coed, Immaculata is deeply Catholic, following the values of the Sisters, Servants of the Immaculate Heart of Mary who founded and still guide the university. Ethical leadership, social justice, and peace are at the center of Immaculata’s teaching. The values that drive Immaculata inform their online BS in Emergency Planning and Management degree program. This degree-completion program prepares students for the decision-making, communication, and cooperation that are essential for responding to emergency and disaster situations. The online format includes synchronous and asynchronous classes, and military veterans and personnel qualify for course credits and tuition discounts on Immaculata’s already solid rates. The University of Maryland University College is an exceptional, designated adult and professional institution in the UM system – a fully independent university dedicated to meeting the particular needs of adult learners. Beginning as a division of the University of Maryland in 1947, UMUC helped blaze the trail for distance education over its history, and today is one of the largest distance educators in the world, with over 90,000 students. With UMUC’s expertise in professional education, their online programs are well-known as top-tier values. The UMUC Public Safety Administration Bachelor of Science degree is a thorough education in emergency management that graduates can carry into a variety of public and private security careers, from federal and state government to private contractors. Plus, UMUC’s tuition is kept at one of the lowest rates in the region, offering working adults an investment sure to pay off. The oldest university in Long Island, Adelphi University is a private institution recognized by U.S. News & World Report and the Princeton Review as a top regional university for the north. Adelphi also helped set the standard for adult education by being one of the first to set up a designated school for adult learners, the Adelphi University University College. Adelphi’s University College has also been widely praised as a top choice for military education. Adelphi University offers an online BS in Emergency Services Administration, a degree-completion program for students who have already earned an associate’s degree or equivalent and want to move into higher positions. Adelphi’s ESA degree is especially directed toward working adults in the service field, including firefighters, police officers, and EMTs, providing a convenient and proven way to increase their credentials with a reputable degree. Widely named as the most innovative university in America, Arizona State University has spent the 21st century growing into the largest student body in the US, largely through their focus on online education. ASU Online has become a standard model for online education throughout the nation, with high-quality, up-to-date instruction and a proven return on investment. Working professionals and other nontraditional students have made ASU a success. ASU offers an online BS degree in Public Service and Public Policy with a concentration in Emergency Management and Homeland Security. ASU’s College of Public Service and Community Solutions is home to some of the most highly-ranked programs of their type, and the Emergency Management and Homeland Security concentration carries graduates into their careers with the trusted ASU name. A mid-sized, regional institution, Jacksonville State University is charged with bringing professional and technical education to the people of rural eastern Alabama. Regionally accredited, JSU also has many individual programs accredited as well, including crucial fields such as nursing, computer science, and engineering, and is notable for their rare PhD in Emergency Management. Students interested in the Emergency Management field can get their start with JSU’s online BS in Emergency Management, a fully online bachelor’s degree that is designed to accommodate working adults already in EM careers, or ready to change careers. The EMBS can be combined with a minor in Homeland Security or in Public Service Telecommunications for further job-market credentialing, and JSU’s low tuition rate ensures a reliable return. National University is the second-largest private, non-profit university in California, built on a unique dedication to the needs of working adults and military students. Founded in 1971 by retired Naval officer David Chigos, National focuses on professional and technical education and training for non-traditional students, with particular emphasis on health and nursing, education, business, and engineering. National is also an online education leader, offering mostly accelerated 4-week courses for busy professionals to earn their degrees around their work schedules. The National University online BS in Homeland Security and Emergency Management brings all of National’s expertise in military, civilian, and business security applications together. With a low price and the trusted reputation of the National University name – known throughout the military and commercial world – graduates can be sure their Homeland Security and Emergency Management degree will pay off. Colorado Technical University is a for-profit, STEM-focused institution in Colorado Springs, CO. In addition to regional accreditation, Colorado Tech has been cited by U.S. News & World Report for their quality and value. Founded in 1965, CTU has really hit their stride with the advent of online education, and today nearly all of their students – more than 90% – are partially or fully online, leading USN&WR to rank CTU among the very best online educators in the nation. Colorado Tech offers a BS in Criminal Justice with a concentration in Homeland Security and Emergency Management, a bachelor’s degree that can be earned in full, from freshman to graduation, online. CTU has been long recognized for its outreach to military veterans and personnel, and this program is tailor-made for military students, developed in cooperation with the Center for Homeland Defense and Security, Naval Postgraduate School. Colorado Tech’s low tuition makes it a smart choice for students looking to enter the security field, or apply their military skills to a new venue. Columbia College is among the oldest women’s colleges in the US, founded in 1854, but today Columbia offers online bachelor and graduate courses for both women and men. While Columbia College is based on the model of the traditional liberal arts college, the contemporary Columbia has embraced online education and the opportunities it provides for working adults to obtain professional and technical learning. Columbia College’s online BA in Disaster and Emergency Management combines the decision-making and reasoning skills associated with a liberal arts education with the technical know-how needed to lead 21st century disaster and emergency safety and recover efforts. Undergraduate courses are taught fully online in accelerated 5-week classes, with an asynchronous format for flexibility and convenience. Columbia College’s reasonable tuition makes it a safe bet. Utah’s largest public university, Utah Valley University has a significant mission – to provide educational opportunity to the people of Utah, forging the leaders of the state’s industry, government, health care, and more. As a large regional institution, UVU is primarily known for professional and technical education, and has made substantial use of distance education to reach Utah’s many rural and working adult residents. Utah Valley University offers an online Emergency Service Administration BS degree that is ideally suited for working adults in Utah who are pursuing careers in law enforcement, emergency management, Homeland Security, and other public safety fields. Fully online classes provide an education around the students’ schedules, and one of the lowest tuition rates in the region gives graduates confidence that they will start their careers ahead of the game. Recognized by U.S. News & World Report as one of the top 30 public regional universities in the south, Eastern Kentucky University is a crucial player in the life of rural eastern Kentucky, providing a wealth of educational opportunity in key professional and technical studies. EKU has especially made its name in online education, making education more widely available through adult-oriented distance education. One such program is EKU’s online BS in Homeland Security degree program. Ranked by U.S. News & World Report as one of the nation’s top online educators, EKU brings their reputation for quality to this online program, which prepares working adults with all they need to know to move into the competitive fields of counter-terrorism, disaster management, and border patrol. At $400 per credit, EKU is one of the strongest investments in education Kentucky has to offer. A small, Baptist-affiliated private liberal arts college, Anderson University was founded in 1911 on the site of a former women’s seminary in Anderson, SC. Anderson has made its mark on the area as an educator of teachers, professionals, and leaders, and in recent years Anderson has made incorporating technology into its curriculum a mission with the Mobile Learning Initiative, a program combining traditional classroom and mobile learning technology that has proven successful enough to be piloted in South Carolina’s public schools. Anderson’s commitment to technology also drives their online programs, such as Anderson’s online Bachelor in Emergency Service Management, which includes an optional concentration in Homeland Security Operations and Administration. Online students may begin with an associate’s degree, or take the entire four years of a bachelor’s degree entirely online. Anderson has been ranked by U.S. News & World Report as a best value in the South, demonstrating Anderson’s solid reputation. Bellevue University has been an inspiring success story since its founding in 1966, having revolutionized adult education in the Midwest. Dedicated to adult and professional education, Bellevue is a pioneer institution in the pioneer region, offering degree programs in necessary areas like nursing, business, computer science, and education. Bellevue has also been frequently cited for the quality of its online offerings, and recognized as a best value. Bellevue University offers a BS degree in Emergency Management that gives prospective emergency workers – including law enforcement, rescue, and security – a thorough grounding in the decision-making, tactical, leadership, and legal skills and knowledge necessary. Offered in an online cohort format, students follow through the courses together to build communication and networking skills, all while benefiting from a world-class education at a low tuition rate. One of the first colleges entirely dedicated to adult education, Thomas Edison State University was founded in 1972 to bring Edison’s values – self-motivation, practical learning, and public benefit – to the working people of New Jersey. Today, TESU is one of the biggest colleges in the state, and a model of professional education, and as an early adopter of online learning, one of the leading online educators in the nation. TESU offers an online BS in Homeland Security and Emergency Management that emphasizes the needs of career safety professionals in the 21st century. While transfer courses are accepted, the TESU online bachelor of science can be earned completely online, from freshman composition to capstone project. This flexible program is especially convenient for service members with demanding schedules, frequent travel, or other significant commitments. Founded in 1916 as a small bible college, Crown College has spent the last century growing into a respected liberal arts college built on Christian principles. Crown has been regularly recognized by U.S. News & World Report as a top regional institution in the Midwest, and its grounding in evangelical values and a biblical worldview appeals to students who wish to bring their faith into their professional careers. Like many other Christian institutions in the 21st century, Crown College has found online education the most effective means of expanding their reach and providing their special variety of education to more students. An online BS in Disaster and Emergency Management from Crown College is a Christian-oriented program to help professionals in faith-based organizations like churches and missionary groups to respond to natural disasters. It’s a unique program for a surprisingly low tuition. Part of the Texas Tech University System, Angelo State University is a respected regional institution with just under 10,000 students and a commitment to the life and well-being of West Texas. Angelo State is a designated Hispanic-serving institution, dedicated to professional education, community engagement, and service leadership in the region. Their growth and development, particularly through adult and online education, have earned ASU ranking as an up-and-coming institution by U.S. News & World Report. 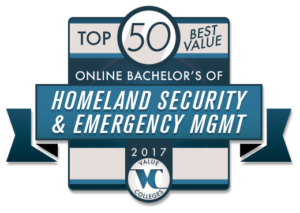 Considering their location in West Texas, the Angelo State online Bachelor of Security Studies in Border and Homeland Security is an obvious choice. This degree completion plan prepares prospective agents for the complexities of law, emergency management, and managerial leadership in the modern age. Angelo State keeps tuition exceptionally low, and has generous transfer plans within the community college system for convenience. Founded in 1976, the University of Hawaii West Oahu was originally an upper-division campus of the UH system, focused only on degree completion programs for primarily adult students. As the region has grown, so has UHWO, providing the people of Hawaii with professional and technical education grounded in liberal arts tradition. Online distance education has extended UHWO’s capacity as an indigenous-serving institution. UHWO offers an online BA in Public Administration with a number of possible concentrations, including Disaster Preparedness and Emergency Management. This online program is designed for students going into, or already working in, public service careers, and the DPEM concentration focuses on the demands that a natural or man-made disaster places on the public sector. Low tuition keeps UHWO a trusted value for Hawaii’s leaders. California University of Pennsylvania has been ranked as a best regional institution for the North by U.S. News & World Report and the Princeton Review. As a public institution in the Pennsylvania State System of Higher Education, California University is a small, up-and-coming institution that has grown significantly in recent years, in part from its highly regarded Global Online programs, which have been widely recognized for quality and affordability. Cal U offers a Homeland & International Security concentration in their online Criminal Justice BS, a fully online degree-completion program designed and taught by established, experienced professionals in the field. This thorough program gives students a full grounding in counter-terrorism, cybersecurity, and other aspects of contemporary security practice. Plus, Cal U has one of the lowest tuition rates in the region, making it a low-risk step toward a rewarding career. St. Petersburg College has been dedicated to providing educational opportunity to the working people of Florida’s Gulf Coast since 1927. Today, SPC specializes in adult education, with the average age of SPC students being 28, and the college has been recognized by the US Department of Education for excellence in professional and technical education, especially nursing, technology, and business. SPC offers an online Bachelor of Applied Science in Public Safety Administration from the College of Public Safety Administration. This bachelor’s program can be earned from SPC’s associate’s degree in Emergency Administration and Management, the first online AS of its kind, and is tailor made for students who want a career as a public safety leader. SPC’s incredibly low tuition makes it one of the best values in Florida. A former community college, the State College of Florida, Manatee-Sarasota has grown since its founding in 1957 into a significant regional institution, with some 30,000 students enrolled annually. SCF focuses mainly on professional and technical programs, with nearly half of all college-bound high school graduates in the two counties attending. SCF has also been crucial in providing managers, technicians, and leaders for the area. SCF offers an online Bachelor of Applied Science in Homeland Security designed for students with an associate’s degree in criminal justice, paralegal, emergency management, or some related field. SCF’s experience and commitment to adult education has made it a trusted name in the region, and one of the lowest tuition rates anywhere ensures that working professionals can get the credentials they need without setting themselves back with debt. Vincennes University is the oldest public institution of higher education in Indiana, and one of the first in what was then the Northwest Territory, having been founded in 1801 by president William Henry Harrison. Vincennes is one of the most accomplished and esteemed two-year institutions in the nation, though in recent years it has begun offering full four-year degrees, and has expanded to offer a number of online programs. One exemplary program is Vincennes’ online Homeland Security BS degree, which can be earned entirely online from freshman admission. Most applicants, however, are already working adults who have an associate’s degree or some prior schooling in the field; these include police officers, EMTs, and firefighters, among others. Vincennes’ convenience and low tuition rate helps these public servants get their degrees while keeping their people safe. Franklin University has been proudly providing educational opportunity to adult students since 1902, when it began, like many evening education programs in that time period, in a YMCA. Today Franklin is a respected private regional university, with a small student body and national recognition as a military-friendly educator, offering programs in key professional and technical fields like nursing, criminal justice, and public administration, as well as strong mentoring efforts from local professionals. Franklin offers an online bachelor’s degree in Emergency Management & Homeland Security. Students can choose from two different paths: the traditional bachelor’s degree, and the subsequent bachelor’s for students who already have a bachelor’s degree in another field. With online classes and a generous transfer policy (up to 94 transfer credits accepted), students can complete their subsequent bachelor’s in only one year. Barry University is a small, private Catholic liberal arts college respected throughout Florida for their high educational quality and commitment to student success. Founded in 1949 by the Adrian Dominican Sisters, Barry emphasizes mentorship, student support, and rigorous learning, and a turn toward professional education and online programs has brought more adult students to the university. Barry offers an online BS in Emergency Management degree geared toward non-traditional-aged students, particularly experienced professionals in the emergency field. The Emergency Management program brings together an interdisciplinary approach combining criminal justice, environmental science, public administration, and other necessary bodies of knowledge for coping with natural and human events. Barry has long been considered one of the best values in the south, and the online EM BS is no exception. For professional and technical education, students in rural northern Iowa have been turning to Upper Iowa University since 1857. In more recent years, UIU has made its top-notch degrees more available to more people by embracing distance education, with 15 extension campuses and an online program ranked by U.S. World Report among the best bachelor’s programs in the nation. UIU offers a fully online bachelor’s degree in Emergency Disaster Management. This program is available only online, and concentrated 8-week, asynchronous classes help busy working adults manage their coursework alongside their day to day commitments. UIU’s tuition is especially affordable for a reputable private university, making it a value on par with any of Iowa’s public colleges and universities. One of the main public research institutions in Idaho, Idaho State University is particularly known for its health and medical programs, including concussion studies, nursing, and psychology. Founded in 1901, ISU is at the center of learning and research in the state, and with a very favorable student-faculty ratio for such a large university, ISU students count on strong mentoring and access to first-hand research opportunities. Idaho State offers an online BS degree in Emergency Management that can be counted among the very best deals in the nation. Taught by an interdisciplinary faculty of experts and practitioners in all areas of emergency management, the ISU program is fully online, but students can still expect the kind of close attention on-campus students receive. Best of all, Idaho State’s low tuition is the same for all online students, regardless of residency, so students can take advantage of this best value anywhere. Grand Canyon University is a regionally-accredited, for-profit Christian research university recognized by the Carnegie Foundation, as well as U.S. News & World Report and Fortune Magazine, which ranked GCU a top choice for entrepreneurs. As an interdenominational, evangelical institution, Grand Canyon considers itself a missional community, welcoming all to bring together their faith and education. Grand Canyon has made their name in the 21st century in large part on the strength of their online degree programs, such as the GCU online Public Safety and Emergency Management BS. GCU’s online degree is specifically geared toward working fire, emergency, and law enforcement personnel who want to raise their credentials for promotion to management. Accelerated 7-week classes and a generous credit transfer plan allow students to complete their degrees quickly. The only small, Catholic liberal arts college in the Cleveland region, Notre Dame College is a recognized by U.S. News & World Report as one of the top regional institutions in the midwest, and one of the most diverse in its class. Founded in 1922 by the Sisters of Notre Dame, NDC was a women’s college until 2001, and today welcomes men and women on campus and online to their high-quality liberal arts and professional programs. NDC offers an online BA in Criminal Justice with several concentrations, including Law Enforcement and Homeland Security. Admissions are made on a case-by-case basis, though students with experience in the criminal justice field, or an associate’s degree, would be most likely to apply. Military students are highly encouraged to apply, and at $250 per credit, their tuition rate is much lower than the already low online rate. Founded by retired Marines Major James P. Etter, American Public University is an outgrowth of American Military University; where AMU was founded to provide educational opportunities for military personnel, APU is directed toward civilians in public service and military contracting. A for-profit institution, APU is regionally accredited and recognized by U.S. News & World Report as a top online educator. APU offers an online BA in Emergency and Disaster Management that was the first online program recognized by Homeland Security and the Foundation of Higher Education for Disaster and Emergency Management. All four years of the full bachelor’s degree can be earned online, and military students receive a discount on APU’s very affordable tuition. Transfer students can also submit up to 90 credit hours toward their degree for quicker completion time. Founded as a computer programming technical school in 1965, Herzing University has grown in just 50 years into a multi-campus, regionally-accredited institution. Herzing focuses on practical professional and technical programs for working adults, including computer science, business, nursing, and law, and has been ranked by U.S. News & World Report as a top online educator. Herzing offers two potential online degree programs in Homeland Security: a BS in Criminal Justice with a Homeland Security concentration, for those more interested in law enforcement; and a BS in Homeland Security and Public Safety, for those more interested in counter-terrorism. Both are offered fully online, and can be completed in as little as 36 months. Herzing University is accredited by the Higher Learning Commission and a member of the North Central Association. Herzing University admits students of any race, color, and national or ethnic origin. A large public research university located in Flagstaff, AZ, at the edge of the beautiful San Francisco Peaks mountain range and the Colorado Plateau Ponderosa pine forest, Northern Arizona University plays a major role in educating the state’s professionals and leaders. Key programs include healthcare and nursing, engineering, and public administration, with high U.S. News & World Report rankings for individual programs in areas like physical therapy, biology, and education. NAU offers an online Emergency Management bachelor’s degree program through the Department of Public Administration and Justice Studies. This program emphasizes decision-making, ethical leadership, and problem-solving skills, as well as the fundamentals of emergency services. The online program is designed for working adults, with a 90/93 plan allowing students to earn up to 90 credit hours from transfer, work experience, and other training. A small, Catholic institution, Neumann University is steadily rising in U.S. News & World Report rankings and public recognition in recent years, particularly as they have built their adult education programs into some of the best in the region. Founded by the Sisters of St. Francis of Philadelphia, Neumann puts a premium on the traditional Franciscan values of social responsibility and educational integrity. Neumann offers an online BS in Public Safety Administration that is directed toward working professionals in the public safety field, including firefighters, EMTs, police officers, and more. This degree-completion program is designed for convenience and speed, with many students completing the program in less than 2 years, and a 20% discount for online students makes for that much more of a value. Founded in 1998, Trident University International is an innovative for-profit institution designed specifically as an online educator. Trident was the first for-profit, online university to be regionally accredited by the Western Association of Schools and Colleges, the leading higher accreditation body in the west, and have proven themselves as a military educator, with an overwhelming majority of their student body made up of active personnel and veterans. With Trident’s immersion in military education, it should come as no surprise that Trident offers an online BS in Homeland Security that prepares professionals in the field for the greater responsibilities of management and leadership. Courses at Trident are taught in a case-based, non-traditional format called the Trident Learning Model, designed to give students a more realistic picture of the demands of the career. Central Penn College is a small, career-centered teaching school largely dedicated to adult education. Founded as a business school, Central Penn focuses on practical, professional degree programs taught by experienced practitioners. More than 85% of Central Penn graduates report finding a job or going on to graduate school in their chosen field, and with accelerated bachelor’s programs, students can complete a degree and an internship often in just 3 years to get out on the job market even faster. Central Penn offers an accelerated online BS in Homeland Security Management with just that benefit – only three years to complete all coursework, and gain internship experience. Courses are taught by experienced public servants from federal, state, and local positions, and small class sizes allow even online students to receive close, personal attention and guidance. A low tuition rate and a fast turnaround time makes Central Penn’s Homeland Security program a clear value. A regionally-accredited, for-profit institution in Waterbury, CT, Post University was founded in 1890 as a secretarial and business school. In the decades that followed, Post has maintained its focus on career-driven, experiential education delivered by experienced professionals in the fields they teach. Post has also been a distance education pioneer, establishing some of the first online degree programs and earning U.S. News & World Report recognition for online undergraduate degrees. Post offers an online BS in Emergency Management and Homeland Security degree program that gives students a thorough grounding every aspect of security, from natural disasters to terrorism and WMDs. Students can earn their full four-year degree online, and can choose concentrations in Criminal Justice Leadership or Policing for further specialization.